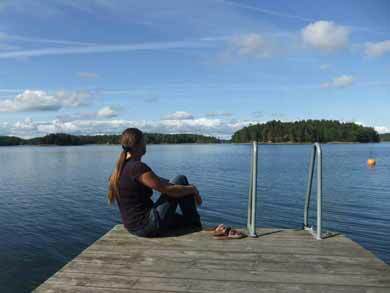 Easily-accessible from Sweden's capital, the Stockholm Archipelago can nevertheless feel a world away from the city. Ideal for those wishing to combine a kayak tour with a city visit or with one of our other outdoor activities in the area, or if you are looking for a short outdoor getaway with minimal travel time, Overnight Sea Kayaking in the Stockholm Archipelago offers two full days of guided paddling among the beautiful forested islands of the Middle Archipelago. You will be camping wild for the night - time for an evening dip! Photo: HK. No previous kayaking experience is required and the tour is suitable for beginners as well as those with some experience. Single kayaks are used as standard, with double kayaks available on request. You will need to overnight in Stockholm the night before, meeting at the kayak centre at 10.00 on the start day to begin your adventure. During the tour you will have an opportunity to get paddle tips from your guide to improve your technique and to learn about the natural history of the archipelago. This area is home to White-tailed Sea Eagles and Ospreys and with luck you may see these magnificent birds on the tour. The route taken will depend on wind and weather conditions - the nature of the archipelago landscape means that there are a number of possible options to take advantage of the best conditions. In the evening you will choose a suitable island to make camp, preparing your food together under the stars. 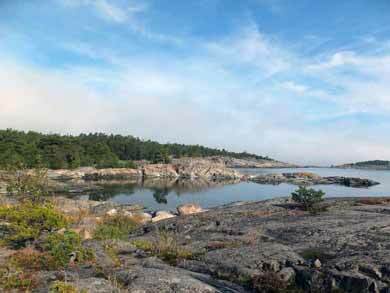 The Middle Archipelago is a beautiful network of forested islands. Photo: HK. An evening dip in the archipelago waters can be the perfect ending to a day's paddling - the water of the Baltic is only slightly brackish and ideal for a refreshing swim! Next morning you break camp and take to the water once more for a day's kayaking, stopping for lunch along the way and ending back at the kayak centre around 17.00. Suitable for solo travellers or those travelling with one or more companions, Overnight Sea Kayaking in the Stockholm Archipelago is a wonderful introduction to the paddling opportunities available in the archipelago region. The tour begins from the kayak centre at 10.00. After introductory meeting, you will pack the kayaks and take to the water. You stop for lunch and make camp on a suitable island in the evening. Everyone assists with tasks around camp such as preparing meals, washing up, and setting up camp. After breakfast, you pack the kayaks and continue your tour with another day's paddling. You will be back at the kayak centre for tour end around 17.00. Additional public tour dates between June and August can be opened on request from minimum 2 persons, subject to availability. Private tours can also be offered on dates by arrangement at standard per person prices based on minimum group size 3 persons. Tours longer than 2 days/1 night are also possible. Please contact us to discuss your requirements. Sleeping bag and liner: Guests are normally recommended to bring own sleeping bag and liner, but these are also available to hire if required. Sea kayak and all necessary equipment including paddles, buoyancy aid and splash skirt, map case with map and compass. Necky kayaks are used, normally Looksha 17 and Eliza for single kayaks and Looksha T for double kayaks. Single kayaks are used as standard for all persons. Double kayaks are available on request (for guests booking as 2, 4 persons, etc - please specify on booking if you would like double kayak. Tent: two participants per 3-person tent. Solo travellers will share tent with other same gender participant or have own tent if there is no other same gender participant in the group. Cooking and eating utensils. Everyone assists with preparation of meals and tasks around camp, etc. Two 20 litre waterproof storage bags per person. Foam sleeping mat. Please bring own sleeping bag and liner (unless hired as optional extra). Lunch and dinner Day 1, breakfast and lunch Day 2. Drinking water is also provided. You may wish to bring additional snacks for additional energy when paddling, etc. Sleeping bag and liner: We recommend you bring own sleeping bag and liner (packed in waterproof bag) for the tour, but this can also be hired as optional extra. You must be able to swim and enjoy the outdoors. No previous experience of kayaking is required. Minimim age for scheduled tour 16 years. For private tours on other dates, younger participants are welcome by arrangement. The tour is suitable for both novice and more experienced kayakers (participants with previous experience should be aware that the level of the tour will be adapted to meet the needs of the least experienced guests). The tour is guided and the nature of the archipelago means that the route taken, distance covered and level of challenge is very flexible depending on wind and weather conditions. To a certain extent the tour can be adapted depending on the level of the group. Scheduled tour dates have no minimum and are guaranteed to run from the first booking. Max. group size for scheduled tours 6 persons. For private tours, larger groups may be possible. Please contact us to discuss your requirements. Fly to Stockholm. Travel by public bus from central Stockholm to Sunds Gård (approx. 40-60 mins) from where it is just over 2km on foot to the kayak centre (taxi is also possible as an alternative). Ferry Dover-Dunkirk or Newcastle-Amsterdam for onward train connections to Stockholm. We also offer a self-guided version of this tour with flexible duration.